Borongan – In 2013, one of the world’s strongest typhoons devastated the Philippines and killed thousands of people. In light of the destruction, the Russians were quick to lend a hand. They were among those who helped and sent donations to the victims, particularly in Samar, located in the western Philippines. It can be viewed as a gesture of appreciation for the people who helped them when they fled prosecution seventy years ago. The small island of Tubabao in the town of Guiuan once served as a refuge for 6,000 White Russians, survivors of the Bolshevik Russian Revolution and Russian Civil War. They were supporters of the Tsar’s imperial court who adopted white as their official color, hence they were known as the White Russians. A civil war erupted following their protest against the Communist regime (i.e., the Red Russians) that caused thousands of White Russians to migrate to a safer land. While a handful of affluent White Russians were accepted in countries such as America and Europe, the unfortunate took a grueling land journey to China, where they were allowed free entry, even for those without visas or passports. When China was about to be invaded by the Communists led by Mao Tse tung, the White Russians felt they needed to transfer to a new location for their security, since they are known as anti-communist. 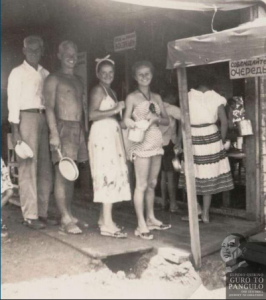 With the help of the International Refugee Organization (IRO), President Elpidio Quirino allowed the White Russians to settle in Tubabao, previously a receiving station of the U.S. Naval Base during World War II. Aboard a battered ship crewed by Chinese prisoners knowledgeable about sailing, the White Russians made it to the Philippines after more than a week’s journey. Before the arrival of the refugees, the uninhabited island was initially accessed by a batch of young men called the “working group,” along with members of the National Organization of Russian Scouts (NORS). They were mandated by the IRO to organize the site and make it a comfortable community for the resettlement of the refugees. Several churches for different religions were constructed, including two Russian Orthodox Churches blessed by Saint John Maximovitch. Almost immediately, the evacuation site became a sanctuary and developed into a flourishing little Russian city. Schools, a hospital, an open-air cinema, an arbitration court, and a small jail were established. In addition, different recreations, such as film showings, cultural shows, concerts, ballets, and other performances were organized to keep everyone entertained and boost morale among its people despite the dire conditions. Although most of the younger people viewed the island as an adventure-filled paradise, the adults saw it as the opposite, as they had to bear with the unfamiliar climate, the scorching heat of the sun while living in tents, the monsoon rains, and the bleak future that awaits their families. It was a tough life but the Russians were strong enough to surpass that chapter in their lives. Following several appeals to different countries by Saint John Maximovitch and Gregory Bologoff, a Cossack and a former colonel in the Russian Imperial Army, the White Russians were finally allowed to permanently resettle in Australia and the United States. Eventually, after a three-year stay in the island of Tubabao, the rest of the population moved to other parts of the world, such as Germany, France, Uruguay, and Argentina. Despite the fact that many years have passed since, today’s White Russians have a special spot for the Philippines. Recently, a solo concert entitled “Thank you, Philippines” was performed by one of the former refugees, Nikolai Massenkoff, as a token of appreciation for allowing White Russians in the island. A small group of Orthodox travelers also revisited the island in 2013 before typhoon Haiyan struck the country. Immediately after the catastrophe, they were quick to send assistance to help the victims.